EWI of San Diego champions literacy initiatives, which support local organizations through outreach and financial support. In 2016 EWI of San Diego named their literacy award after Adele Asmer. Casita Elementary School’s plan is to have Family Book Club nights once a month to read and discuss children’s literature. 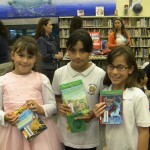 Each month all participants will receive a grade level book to take home and keep. The following month those students and their parents meet to discuss, like a book club, the previous month’s book. 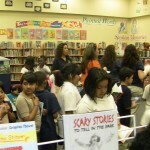 The staff is available and highly motivated to make the family reading nights successful and well attended. Casita serves a community that is 60% socio-economically disadvantaged and “putting books into the hands of the children” will be a valuable tool in getting the kids there as many of them will not have any books of their own at home. 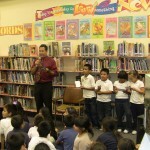 They will have games, guest readers, contests and awards. The YMCA of San Diego County Border View Family YMCA Branch will use their grant to set up reading “rooms” at Juarez Lincoln Elementary School and the Border View YMCA Child Watch Program, two programs like Casita, that serve socio-economically challenged families. Both locations will create reading areas with comfortable furniture, books and supplies to encourage reading and writing. YMCA employees will be utilized in reading with and tutoring the children participating. They will work to bring the staff and the families together in working with readers who are behind grade level. Our grant will provide that space and the reading materials that will teach the children “what curling up with a good book” means. Trish Ghio, Anthony’s Seafood Group Co Chair; Beth Sullivan, Alternative Health Source Co-Chair; Anna Kintzer-McCutcheon, San Diego Theatres, Inc.; Bonnie Reiner, Deloitte & Touche, LLP; Charlita Shelton, University of the Rockies; Donna Simon, S.D. Air & Space Technology Center; Gracia Hinesh, Life Member; Jan Rogers, Francis Parker School; Pat Evans, S.D. Convention Center Corporation; Besse Johannsen, Ferris & Britton, APC; and Kathy Trombley, Magpie Enterprises, Inc.